World of Warcraft: Get a floating pirate ship mount for pre-paying 180 days of game time – AiPT! Arrrr, mateys! What better way to celebrate Pirate’s Day? Blizzard today hotfixed a number of things into the current build of Battle For Azeroth. 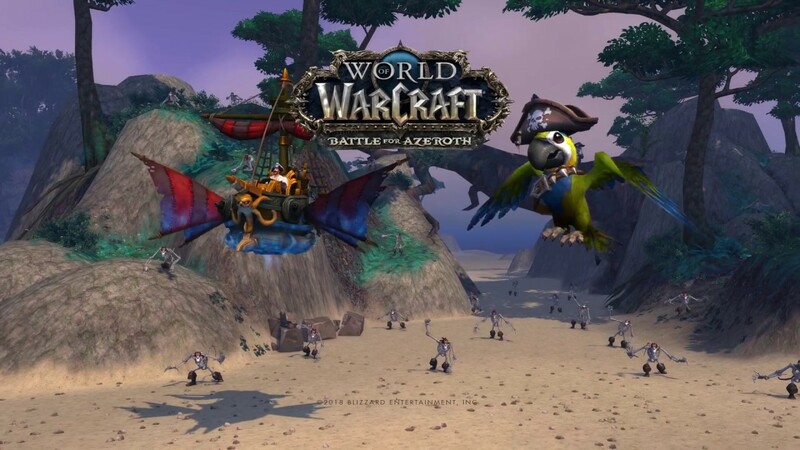 Among the usual things, such as class balance or NPC behavior tweaks, were two surprise additions keeping with the theme of Pirate’s Day on live servers: A new pet and a new mount. That’s right, a floating pirate ship mount, called The Dreadwake. This one is also available via in-game shop, but at least for now, there’s a catch: You don’t just pay for this mount straight up. Instead, you must commit to and pay for 180 days of play time, which will run you about $78. That seems like a hefty price, but let’s be honest, most of us are going to be playing for the next six months anyway, so if you can swing the purchase now, it’ll actually save you a few bucks in the long run compared to paying $14.99 every month. If you’re interested in that deal, you must do it between now and October 21. After that, The Dreadwake will disappear for a bit before being available once again as a straight-up in-game shop purchase some time in 2019.